If you know anything about me, you know that some of my very simple joys in life include pretty paper, snail mail, froyo ...and fun napkin rings! There is nothing better than a napkin ring to match a themed dinner - for the 4th of July, Easter, Christmas, Thanksgiving, Valentines Day, etc... whenever, really! The only problem is that these little suckers can get pretty expensive when you want to buy a whole set. So I set off to Pinterest, and found a great popsicle stick DIY that I just had to try. 1. 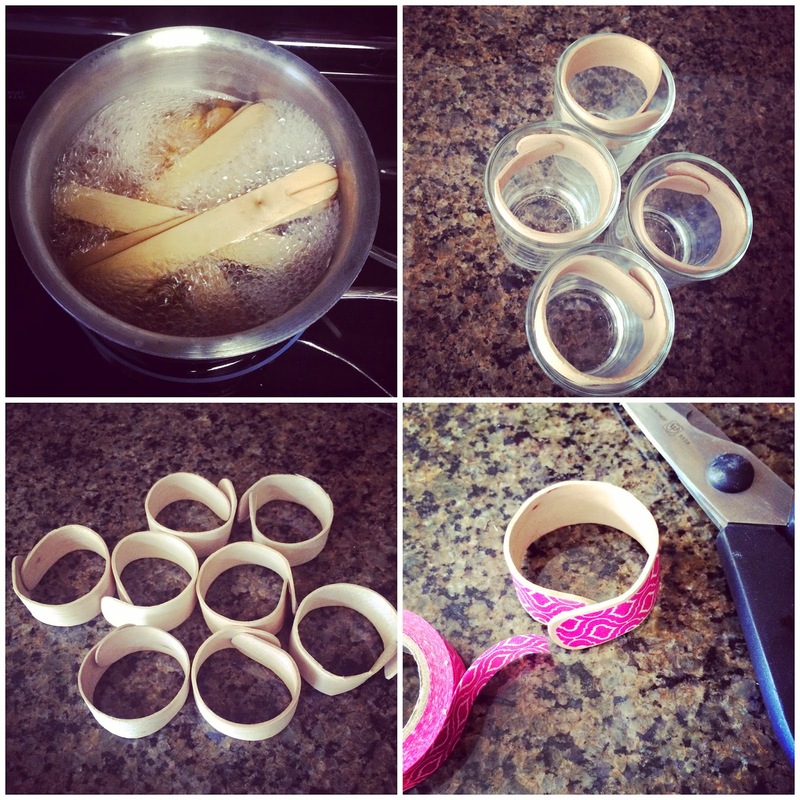 Begin by putting your popsicle sticks in boiling water for 30-45 minutes. Boil twice as many sticks as you think you may need in case some splinter when you're bending them. 2. After the sticks have boiled, remove them from the water and bend in a circle (you will want to use an oven mitt since they will be pretty hot). Take it slow when you're bending them, but you will need to use a little bit of force. 3. Place the curved sticks in a drinking glass, or something round to keep their form, and let them sit over night (I used candle votive holders to keep my sticks rounded). 4. In the morning, the wood should be completely dry and the sticks should hold their shape. 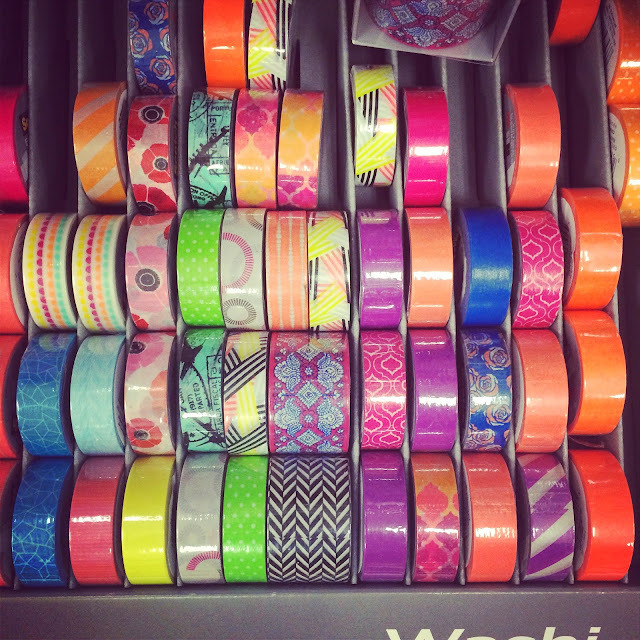 Cover the sticks with washi tape and cut the exposed edge of tape to match the roundness of the stick. The great thing about these little guys is that you can make them fit any look (pending washi tape is available!). And really, you can buy a pack of 150 popsicle sticks for $2.99, so you won't be breaking the bank! 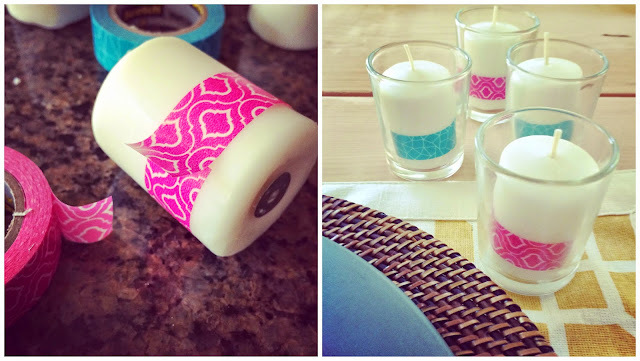 And to use up the remaining washi tape and dress you table up further, you can wrap the washi tape around candles to have at the table! Oh wow! 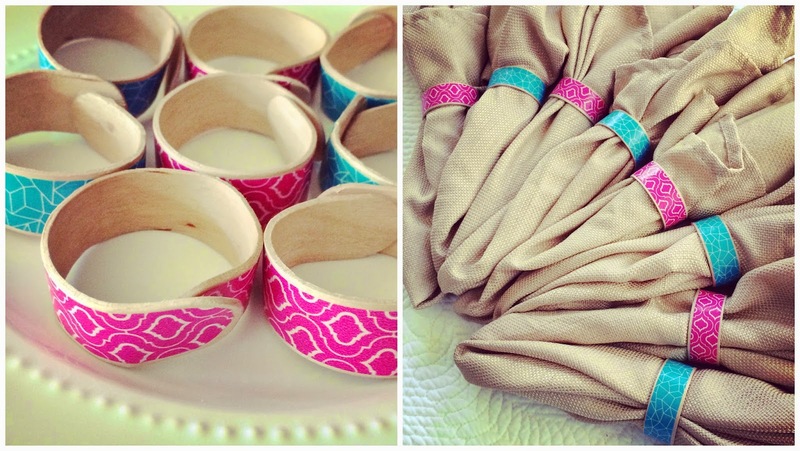 Those napkin rings look awesome! Headed there now - I'm sure it's another DIY success! Those are so cute and great for summer! Going to check it out now.. These are amazing, I would 100% buy these in a store. Ready to open up shop yet??? Literally every single DIY you make I love. EVERY SINGLE ONE! Great taste and style, Lisa! These are super cute! I love the colors. I love that these are patterned! So cute, and you could do this for holidays as well! Lisa, those are awesome! 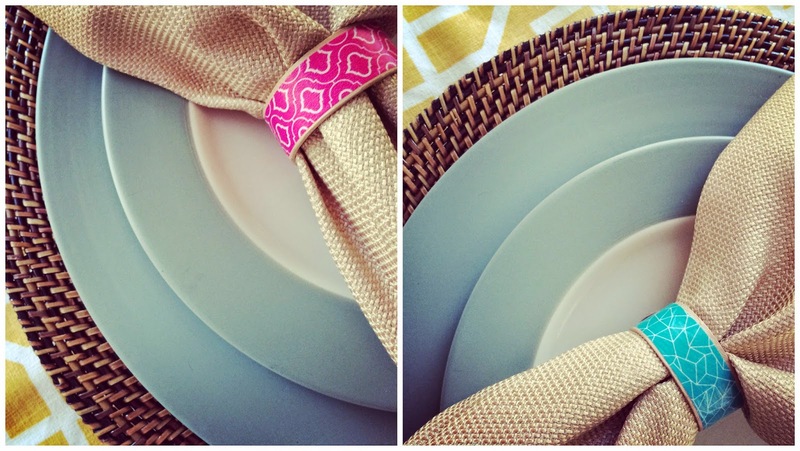 You are the queen of DIYs! Seriously! Those look so, so, so good!!! I'm pretty sure we might have the same dishes too - LOVE!! I just adore all your DIY's!